Salta (now in NW Argentina) was founded on this date in 1582 by the Spanish conquistador Hernando de Lerma, who intended the settlement to be an outpost between Lima and Buenos Aires. De Lerma was named Governor of Tucumán, (in present Argentina) in 1577 by Spanish King Philip II. Described by historians as a man of violence, de Lerma had problems with several people from the area, including fellow countrymen. Among those he persecuted were the spokesman of a Catholic bishop. 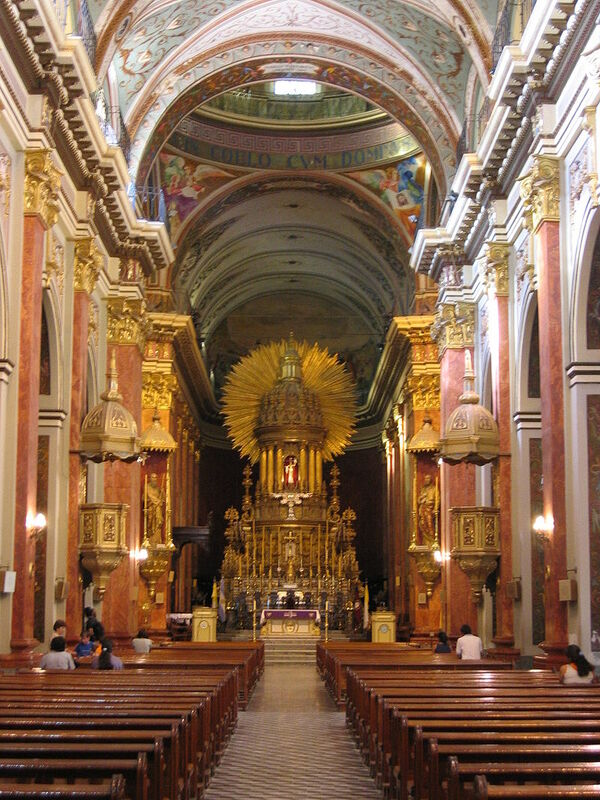 He also disliked Francisco Salcedo who built a church in Santiago del Estero. Many of de Lerma’s opponents ended up in jail or being killed. Salcedo fled to another city, but he was returned to Tucumán by de Lerma’s men after his location was discovered. In Tucumán, Salcedo was tried and jailed. A number of Salcedo’s supporters were killed. In April 1582, de Lerma founded the city of Salta, next to the Arenales River. He foresaw Salta as an economic center, since the Spanish government had opened seaports in Santiago de Chile, Callao, and Buenos Aires. Salta’s situation between the Viceroyalty of Peru and Buenos Aires, according to de Lerma, would be an advantage for the city, because he believed that Madrid’s government would re-route their shipments through Salta. He named the city Ciudad de San Felipe y Santiago del Lerma en el valle de Salta, which was subsequently shortened to Salta. De Lerma befriended Indians who populated the area, believing they could be of help to him, especially with their labor. He also attracted Spaniards to the area. After he established the city, however, de Lerma had to face many new rivals and problems. More conquerors arrived in Salta and tried to seize the city, causing multiple feuds. The city went through many periods of disease, and it had been erected in an area with frequent tremors. 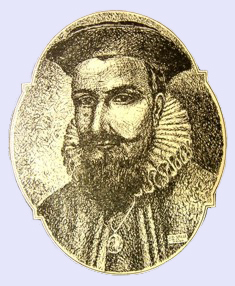 In 1584, de Lerma was arrested and sentenced to jail in Salta. He appealed, and returned to Spain to take his case to the supreme court, but his appeal was rejected and he was sent to a Spanish jail. While it is known he died in jail, the year in which he died is not known. Historian Paul Goussac wrote that “de Lerma’s administration was nothing but a series of criminal attempts.” Salta-born historian Armando Bazan describes de Lerma “as malign as a disease.” Well, I think all of the conquistadores were as malign as a disease, but Lerma was apparently more like pneumonia whereas the others were simply a bad case of ‘flu. During the war of independence, the city became a commercial and military strategic point between Perú and the Argentine cities. Between 1816 and 1821, the city was led by local military leader General Martín Miguel de Güemes, who, under the command of General José de San Martín, defended the city and surrounding area from Spanish forces coming from further north. Salta emerged from the War of Independence politically in disarray and financially bankrupt, a condition that lingered throughout much of the 19th century. However, in the late 19th and early 20th centuries, the arrival of Italian, Spanish and Arab immigrants, particularly Syrians and Lebanese, revived trade and agriculture all over the area while further enhancing the city’s multicultural flavor. 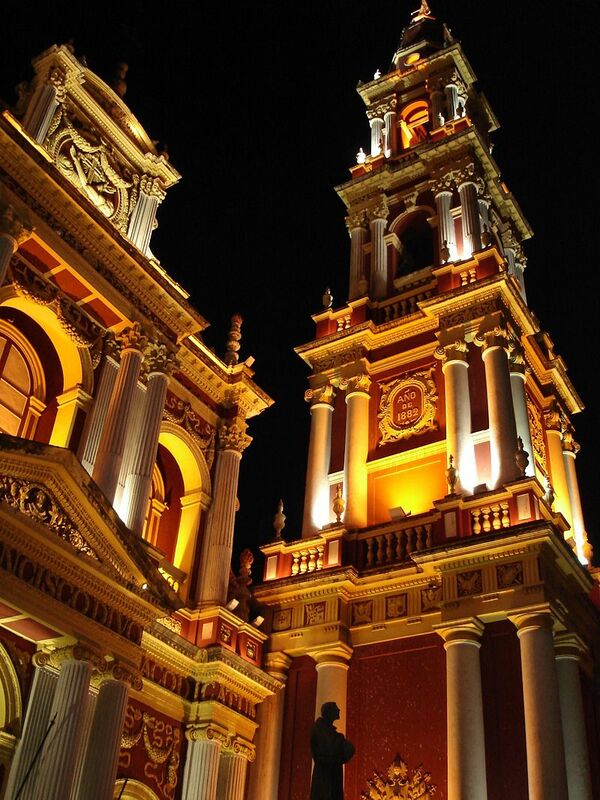 Salta is one of my favorite destinations in Argentina, and I have many friends there. I’m debating living there when I return to Argentina. It is situated in the Lerma Valley, 1,152 metres (3780 feet) above sea level, at the foothills of the Andes mountains. The weather is warm and dry, with annual averages of 756 mm (30”) of rainfall and an average temperature of 16.4 °C (20.4 °C in summer, 10.8 °C in winter). January and February are the months with greatest rainfall. During the spring, Salta is occasionally plagued by severe, week-long dust storms. 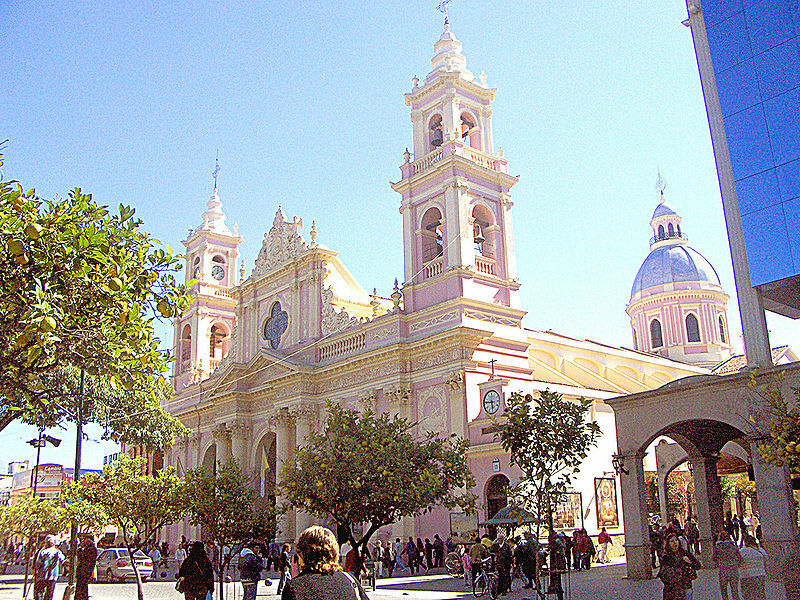 Nicknamed Salta la Linda (“Salta the beautiful”), it has become a major tourist destination due to its old, colonial architecture, friendliness, excellent weather and natural scenery of the valleys westward. Attractions in the city proper include the 18th century Cabildo, the neo-classical style Cathedral, and the 9 de julio central square along with San Bernardo hill and its surroundings. The city’s museums exhibit a wide range of artifacts and art work from the native civilizations that flourished in the area (Salta is located in the southernmost region of what was the Inca empire, belonging to the Collasuyu, one of the four areas the empire was divided into until the Spanish conquest), as well as from the 16th century Spanish conquest and the colonial and post-colonial periods. Salta is also the starting point of the “Train to the Clouds” (Tren a las nubes), and on the way to the red soils of Cafayate. The general region of Salta is regarded as the one most influenced by native Indians, and its foods are closely linked to the Andean-Incan tradition. When preparing regional dishes, potatoes and corn are common, along with quinoa, peppers, squashes and tomatoes. The most celebrated dishes are humita and tamal, in which the corn husk is stuffed with a corn filling and seasonings or meat. The popular Argentine dish, locro, also comes from this region. Arguably, however, the empanadas from Salta are the best in Argentina. 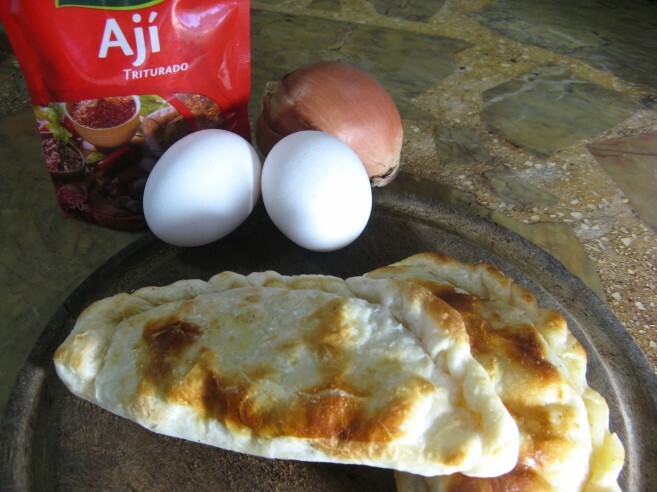 Empanadas salteñas are distinctive in that the meat for the filling is chopped, not ground, and is mixed with potatoes and hard boiled eggs (among other things). In Argentina I buy the pastry discs for the empanadas readymade, but you can easily make them yourself if you have the time. Argentinos are divided about spices. 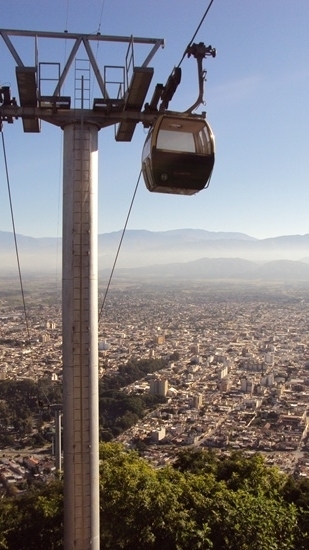 In Buenos Aires all hot spices are avoided, but in Salta a little heat is all right. Your choice. Boil the potatoes until they are al dente. Do not overcook them. Finely chop the meat, onion, and potatoes. Heat the olive oil in a large pan and fry the meat until golden brown. Add the onion, potatoes, cumin, chilli (if used) and paprika, and enough water from the potatoes to cover the mixture. Cover and cook until the meat is tender. Add salt to taste. Leave to cool, then add the chop the egg and spring onion, and add to the mixture. Preheat the oven to 180°C. Shape the dough into circles approximately 13cm in diameter. Add a heap of filling into the centre of each disc. Wet the edges with water. Fold the disc in half, then seal the edges with a fork or finish the empanadas with the repulgue fold (pictured). Brush the tops with beaten egg yolk and bake for 25 minutes, or until the pastry is golden brown. Serve hot from the oven.